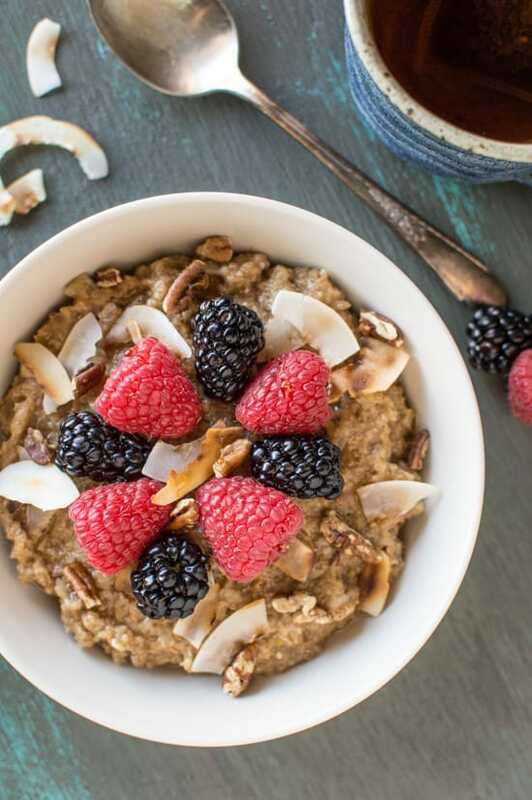 This chai tea infused oatmeal is just what you need to shake up your morning routine. Top with your favorite fruits and nuts for a nutritious breakfast! By the time you read this I’ll be on a flight heading to Anaheim for the Natural Products Expo West. On a 6:00 a.m. flight. Oy, why do I do this to myself and schedule such early flights? Let’s just hope I’m not that annoying person who leans into their neighbor while trying to catch a few Zs. Okay, maybe I will be that annoying person. I’m getting quite excited for the expo because it will be like walking into one giant Whole Foods, but with free samples everywhere. Oh, and I also found out that I get to check in a bag for free! Friends, I might need you to check up on me to make sure that I don’t get too overboard. I’m prone to snag any free thing I see. Seriously, shoot me a message, hound me on social media, and stop me if I decide to bring back 45 pounds of loot. Since I’m going to be waking up very early in the morning, I’m going to want to have breakfast ready in no time. Mornings are still a bit chilly here, so I’ve been cooking a lot of hot breakfasts lately. (As I write this sentence, I can hear my friends from the East Coast snickering at me for daring to describe the weather in the Bay Area cold.) In anticipation for this trip, I cooked up a big batch of chai tea oatmeal for reheating in the morning. I always cook my oatmeal with plain water but decided to cook it in brewed chai tea instead for some extra flavor. The chai flavor was subtle, but I loved that it was something different from my normal breakfast routine. I don’t know about you, but I’m quite picky about the texture of oatmeal. Cooked plain rolled oats is much too mushy for me. What I do is mix in a bit of Bob’s Red Mill 10 Grain Cereal to the oatmeal for some extra texture. The additional cereal adds a nice chewy, gritty texture, so I don’t feel like I’m eating baby food for breakfast. If you don’t fancy the overly mushy texture of plain oatmeal either, you should definitely try mixing in some other grains. I promise you won’t regret it! So tell me, how do you like your oatmeal? Bring the tea, oatmeal, and 10 grain cereal to boil. Once the tea boils, reduce the heat, and let it simmer for another minute or two. Stir in the cinnamon and maple syrup and turn off the heat. Serve with your favorite toppings, such as fresh fruit, nuts, or toasted coconut. Disclosure: This is not a sponsored post for Bob’s Red Mill. I just happen to enjoy the 10 Grain Cereal very much and wanted to share the knowledge with you! What a great breakfast idea! 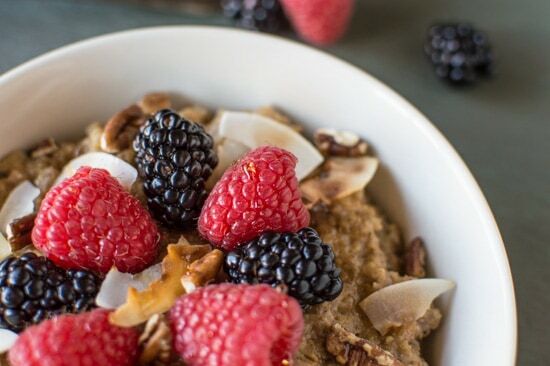 I love oatmeal 🙂 with Chai and berries it sounds just perfect! GAH! I wish I was going to the expo! Have SO MUCH FUN LADY. Don’t mind me, I’ll just be stuffing my face with this oatmeal. 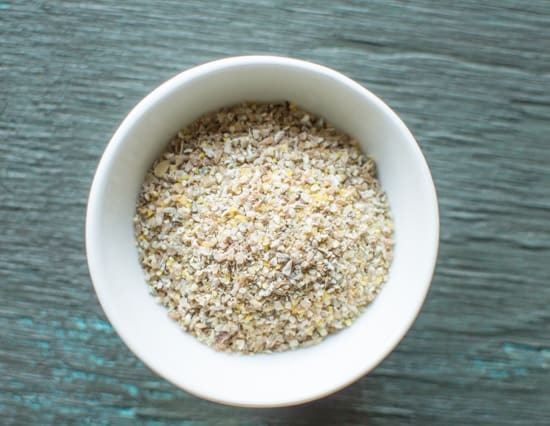 LOVE that you used Chai Tea! Pinned! Thanks, Taylor! Oh man, that expo was HUGE! I ate SOOOOOO much, but that should come as no surprise. This looks delicious! I keep meaning to make tea oatmeal, but unfortunately haven’t gotten around to it yet! Yay for a free checked bag! <3 Hope you have a safe flight, and have fun at the expo! Thanks, Farrah for sending me the reminder to maintain my self control! I still managed to lug home a duffle full of snacks though. Oops. way better than my usual oatmeal. i love this! This sounds delicious! Another perfect 5 ingredient Friday! Have a great time at the expo! Thanks, Sonali. You’re too kind! Thanks, Emily! Let me know if you do try it! Lisa, I love breakfasts like this!!! the Natural Products Expo sounds so fun!! how do you find out about events like this? and I hear you on the early morning flights. . those seem to have the best fares so I get stuck on those early morning flights a lot too!! hang in there!! and have fun! Thanks, Alice! I think I heard about this one through Kitchen Play. I knew it would be a big event but I had no clue it would be THAT big! I had such a great time and ate too much, of course! The expo sounds amazing! You have to post about it and any great finds! I’ll have to do another post with some of my favorite products from the expo! Girl, have SO MUCH FUN this weekend!! I think it’s worth the early flight. 😛 I can never get enough of chai flavors and they are perfect for dragging me out of bed in the morning! I had soooo much fun at the expo! Tiring, but so worth it! Hooray for oatmeal! I think chai spices sound like the perfect combination. 🙂 Have good expoiing! I love the idea of adding chai! Brilliant Lisa! 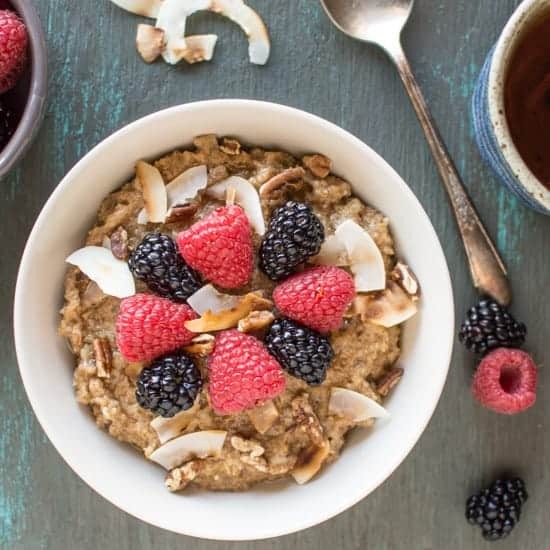 I am loving the look & sound of this chai tea oatmeal.. oatmeal is such a great, filling and healthy way to start the day off with and I must make this one! Thanks, Thalia! I’m definitely thinking of trying this with a whole lot of other teas! Not going to lie, I got jealous when I saw your swag. Do you have swagger to match your swag? SWAG. I love oatmeal and once soaked green tea in it without sweetener. It was heinous. The damn tea bag opened. Sir, you know I gotz swagger. By the way, the Instagram photo only showed half of the swag I got from the expo. I did Mama Lin proud. I do believe I need chai tea infused oatmeal! It sounds delicious, I love chai and oatmeal, why not to combine them? Thanks, Caroline! Let me know how it goes! Wait this is SO GREAT. I love oatmeal and I love chai!! Match made in heaven much? Oh and I hope you ended up bringing home 45 lbs of loot or more!! Because that’s definitely what I would do–love me some freebies 😉 Gorgeous photos, lady! Thanks, Erika!! I brought back sooo much food! My shoulders were sore just walking around with a big bag of food! Replacing water for tea is the most simple and perfect way to cook with tea and get more flavours going. I have made a chai oatmeal before myself, but am intrigued to try your recipe next. Thank you for sharing 🙂 happy steeping & sipping. Thank you so much, Lu Ann!